A review copy of Azul was provided by Asmodee UK in exchange for a fair and honest review. 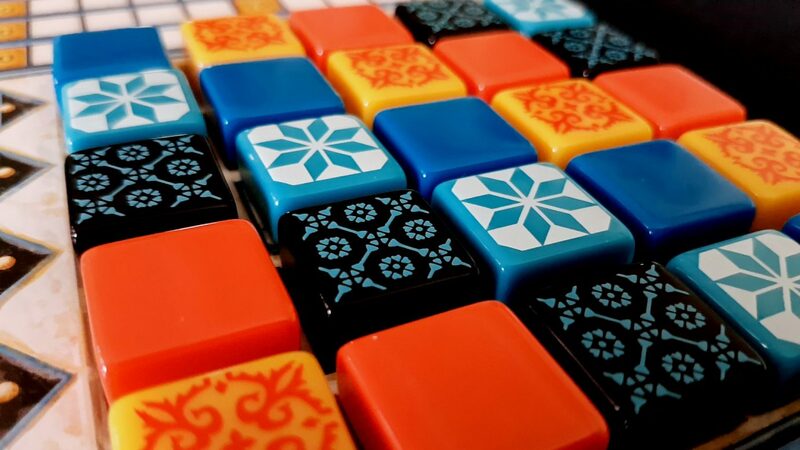 I’ve often spoken on this blog about the joy of tactility – that simply touching and handling lovely components is a substantial part of the fun of board gaming. A hand of cards feels good to hold. Dice feel nice to roll – lots of dice feel even nicer. Poker with chips is a different game to poker with actual money even if at the end you’re just as poor as you would be otherwise. Components matter for many reasons. Poker chips for example add in a layer of abstraction that creates what is called a suspension of judgement. You don’t really properly value the financial cost of a poker chip in the same way you do hard cash. More than that though are the deep networks of association and evocation that are associated with the glamour of a poker chip. The splash of plastic on an overgrowing pot is signalling information that impacts upon us at a very deep, subconscious level. It’s not just when real money is involved either. We feel differently when playing with metal coins as opposed to cardboard chits. Wooden cubes change our perception as opposed to plastic tokens. Components can make us play differently. The feel of a thing distorts our perceptions of a thing. The components of Azul are very nice indeed, and I can’t discount the possibility that’s a big feature of why I love it so much. The clickety-clack of its chunky resin tiles is a seductive sound that I can’t ever quite get out of my head. It’s the sound of promise. It’s the sound of betrayal. 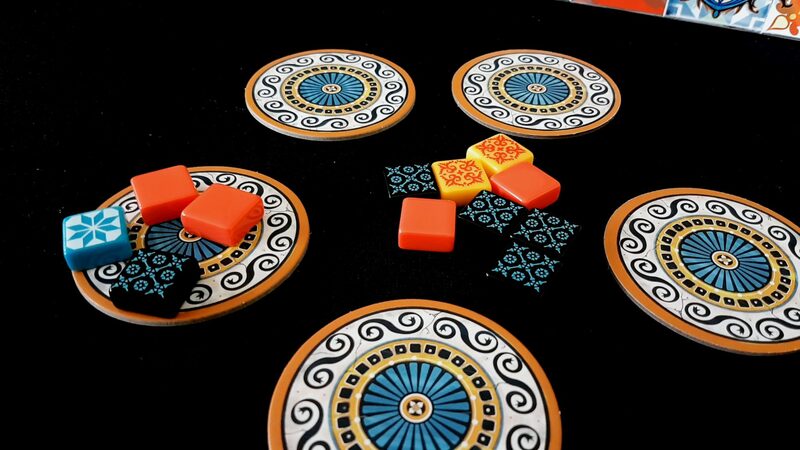 The components of Azul are wonderful. Well, let me roll that back a bit. The components feel lovely. They sound amazing. They look like… well, they look like Opal Fruits. Or Starburst, as I believe they’re called now. Remember when Snickers used to be called Marathons? Heady days, with our lives stretched out in front of us. We could do anything. We could be anything. I wonder what I thought I’d be doing when I was forty back then. I doubt ‘writing a board game blog post about what is essentially Starburst: The Board Game’ would have even cracked the top fifty of suggestions. Here we are, though. All of this is to say that I don’t get why people think Azul looks beautiful. To me it looks like the window display of the world’s least enticing sweetie shop. Azul isn’t supposed to be a game of be fruit-flavoured taffy treats though. 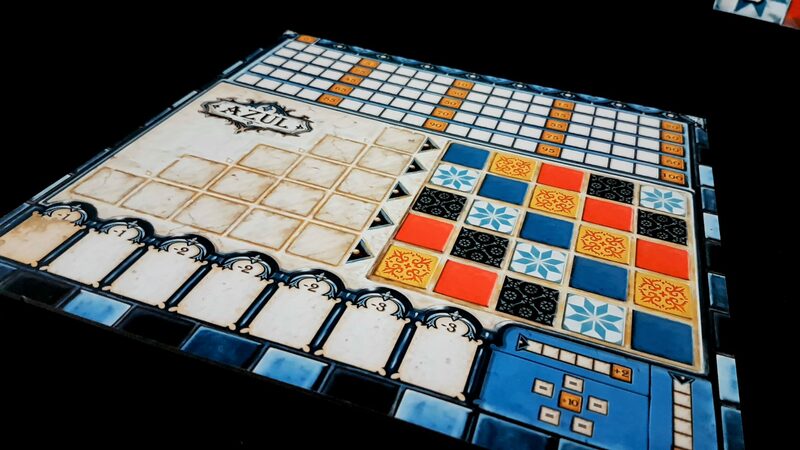 The pieces in Azul represent tiles that you are using to decorate the walls of the Royal Palace of Evora, but that couldn’t possibly matter less. 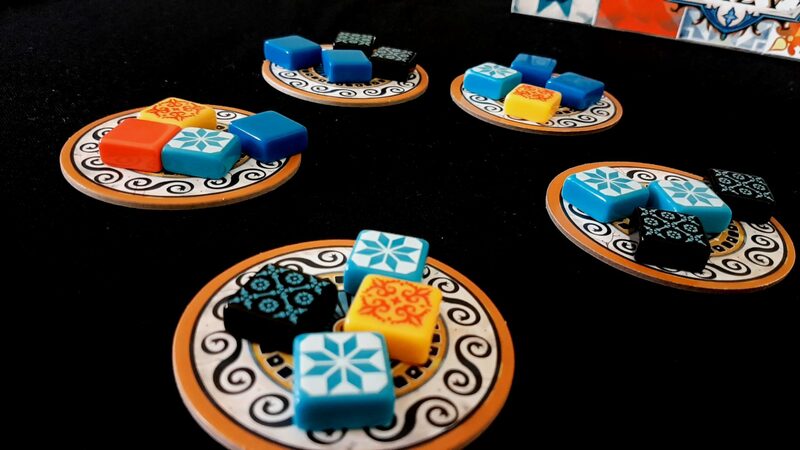 Azul is not remotely thematic – it relishes in the abstraction of its mechanisms, unabashedly opening itself to you as a kind of icongraphical Sudoko puzzle. You have a board in front of you, and that board is overlaid with patterns. Tiles go into their appropriate space in each row, and you get points based on to how many other tiles that are adjacent. Extra points are available at the end for completed rows (a handful of points), columns (a mittful of points), and full sets of five tiles (a snootful of points). Your job when playing is to make big scoring combos in the short-term while also trying to reap as many of the bonuses at the end as possible. The game continues until one person at the table has a fully completed row, at which point you all down tools and give up forever. The game might be set in Portugal but the artisans here have the work ethic of a standard British builder doing a bathroom renovation. It’s never going to be as simple as all that though because you don’t get to simply select tiles and place them. Oh no. Instead, you all take turns selecting tiles from a series of ‘factory displays’. When you take a tile, you must take all tiles of that colour and place them as an unbroken set on one of the five pattern lines of your board. Only when a pattern line is full do you slide a tile onto your wall, discarding all the rest in the process. Pattern lines can contain only one colour of tile and can’t contain a repeat of a tile already in that row of the wall. If you pick tiles you can’t place in any pattern line they instead go to the floor line which represents the substantial penalties you get for messing up on the job. These tiles don’t come cheap, mate. More than my job’s worth to accept a return. Got your receipt? Didn’t think so squire, not a lot of call for them in the 16th century. There’s only one other small twist here – when you select a colour from a display, every other tile in that display gets puts in the centre of the table. Players can take from the centre in exactly the same way as they can a display. Well – almost exactly. The first person to do that grabs the first player tile for the next round and adds it to their floor line. They take a penalty but get the initiative for what’s going to follow. That can be temping because that central area is going to become overflowing with riches before too much time has passed and it can be difficult to resist scooping up a substantial offering even if it comes at your own cost. 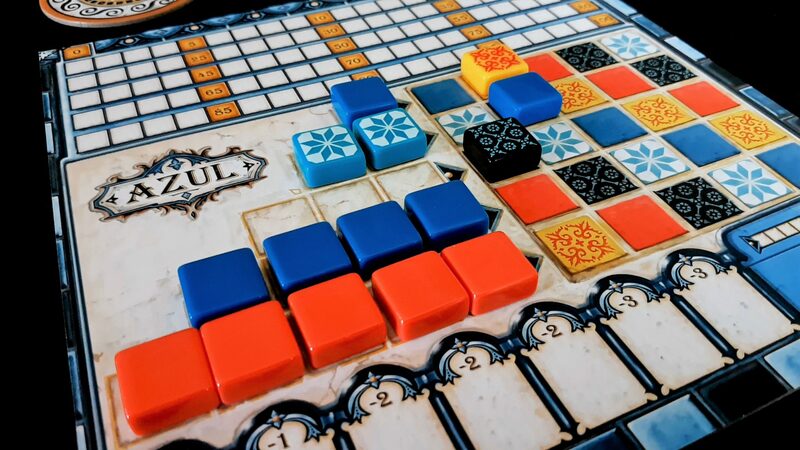 Azul is a tremendously simple game – the top row gets filled quickly and easily, and successively larger amounts of work are needed to fill each subsequent row. You want your tiles to go where they give the largest points but also where you can have the greatest efficiency of allocation. And it’s in that last part – the efficiency of allocation – that the game comes alive. Azul is so charming and approachable that you will happily stride up to stroke its soft fur. You might feel a little bit surprised when it wakes up and raises itself up to its full height to reveal 300 kilos of solid mass, fangs, claws and fury. Azul is a game with bite. In our Sagrada review I spoke about how the noose of randomness there eventually tightens to the point it chokes off your options, and how you’ll curse your opponents as they grab the one die that you both desperately needed. The cost of that kind of action in Sagrada is high though – hate drafting is always to an intense personal cost unless your interest just so happened to co-incidentally intersect with that of your opponent. There are knives at the heart of Sagrada but they’re wielded by the dice. When you’re stabbed by another player you know it was because it was the only real option they had. 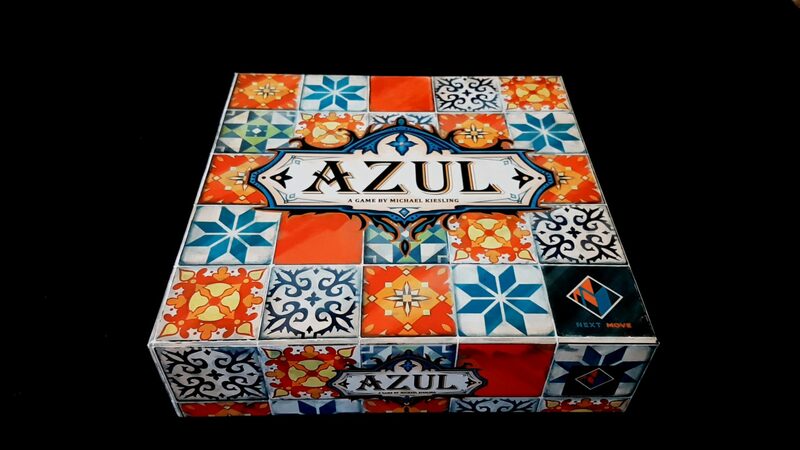 Azul puts the knives directly in the hands of each player and then nods meaningfully towards the offerings. ‘Go on’, it says. ‘They want to steal your tiles. You’ve got a knife. You know what we do to thieves around here’. As with Sagrada, your options will diminish very quickly. Some rows take multiple rounds to make any progress, while others will fill up with dizzying speed and rapidly restrict your options for what can go there. The need to build high scoring combos will create intense competition over certain colours because you all have exactly the same pattern to fill. Sure, there’s a variant board where you get to design your own wall but it’s far more interesting when everyone is getting in everyone else’s way. Azul is built around a kind of psychological twister where no matter where you want to go someone already has placed a leg that will stop you getting there easily. The thing here is that you don’t need all of the tiles of any given kind of colour. If you had the option at the start to simply take all the orange flavoured opal fruits, you’d say ‘no, oh Lord no’. 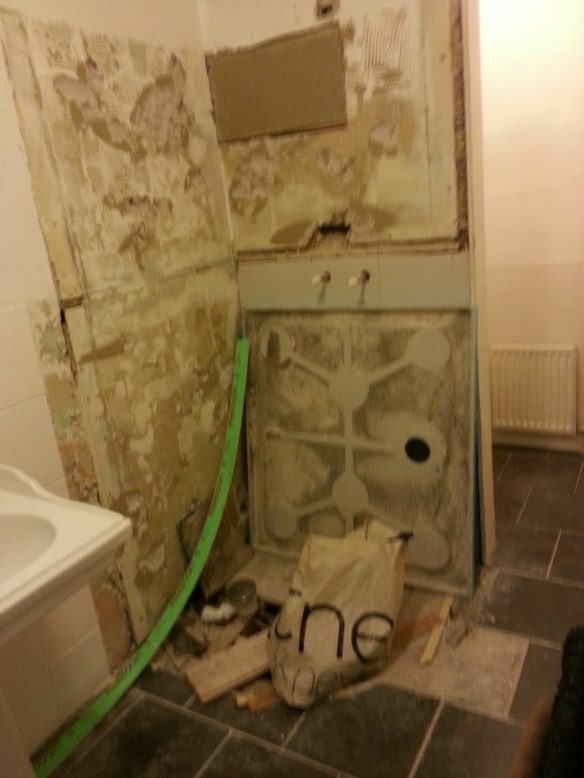 You don’t want all the tiles, or at least – you don’t want them all at once. What you need is the correct number of tiles at the correct times. It’s this subtle but important difference that drives Azul forward and makes it such an interesting game to play. It’s what makes the central offering of tile offcuts so appealing – sure, it might not have as many tiles as you might like but by the time your next chance comes around it might have too many and you always have to pick up the entire collection. You can’t break tiles over multiple pattern lines. Anything you can’t place is a penalty, and those penalties escalate in severity the more tiles you fail to place. Also, those tiles when they are discarded don’t go back to the bag… they end up in the box until you run out and that might be the place you least want them to go. That would be fine except the choice you have is only rarely ‘pick up the right number of the right tile’. You want to be filling the fifth row, despite its heavy cost, because completed columns score so well at the end. You’re hardly ever going to be able to do that in a single move and so you open yourself up to risk as the choices diminish and the pots in the centre increase. You can’t skip a turn, Lord no. When you’ve got five pattern lines filled with tiles, your job becomes entirely one of damage mitigation. The problem there is that it’s very easy for your opponent to see how to inflict pain upon you. They know the valid tiles for you, and they know the flow of tiles. Hell, they get to decide the flow. You spend as much time engineering the downfall of other players as you do building your wall display. You might take a strategic penalty just to leave your opponent with the choice of a knife to the ribs or a kick in the junk. You can actually knock people back down the scoring track and that might be exactly the best way you have to increase your relative standing in the game. 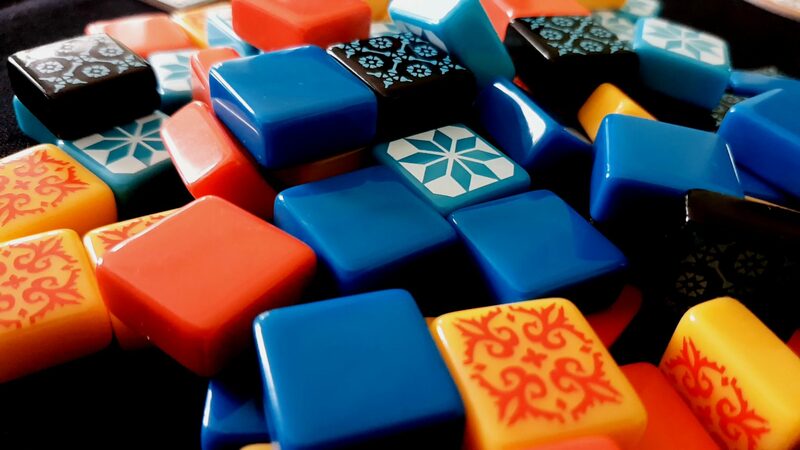 The end turns of a round of Azul essentially become one short and nasty game of ‘Not it’ as everyone tries to avoid taking the seven-tile monstrosity that nobody can place. More than that, sometimes you’re going to be playing a subtler game of opportunity denial. 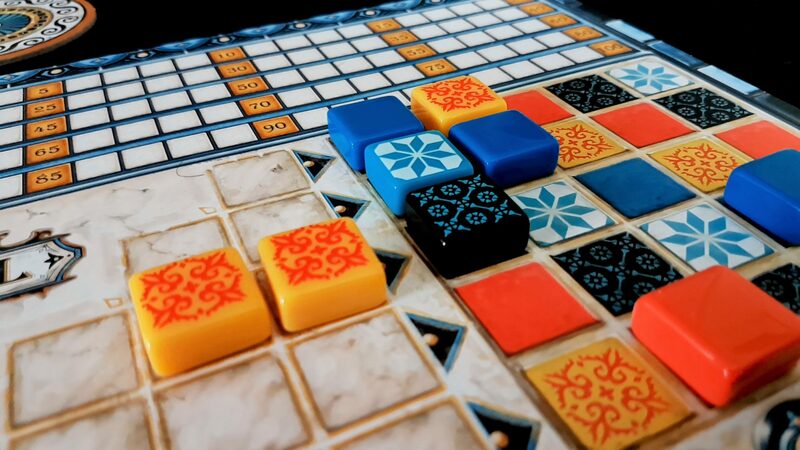 Tiles in Azul score best when placed adjacent to other tiles – the more there are in a row or a column, the more points you’ll get. A savvy opponent will do the best they can to give you only the opal fruits that give you the smallest point yield. ‘Oh wow, you’ll get ten points if you take that liquorish tile. I can’t place it but I’m taking it anyway so all you’ve got is a strawberry starburst that will get you a single point’. Your scores are relative, after all – it’s better to do yourself a small injury than let an opponent inflict a large one. What this all does is give Azul a tremendous amount of decision space for players to explore. That’s not unusual – what’s unusual is how viable the whole landscape of that decision space ends up being. I’ve said before on this blog that good games are engines for generating interesting decisions. A game might offer you a million options of which only one has any merit. That’s not interesting – there’s an absolute right decision and the only difficulty is finding it. Azul gives you a decision space that is full of interesting choices right up to the rapid convergence in the final few rounds. Even with that, when Azul leaves you with no options at all, there’s a beautiful crescendo that is made all the more effective by the tempo that led up to it. 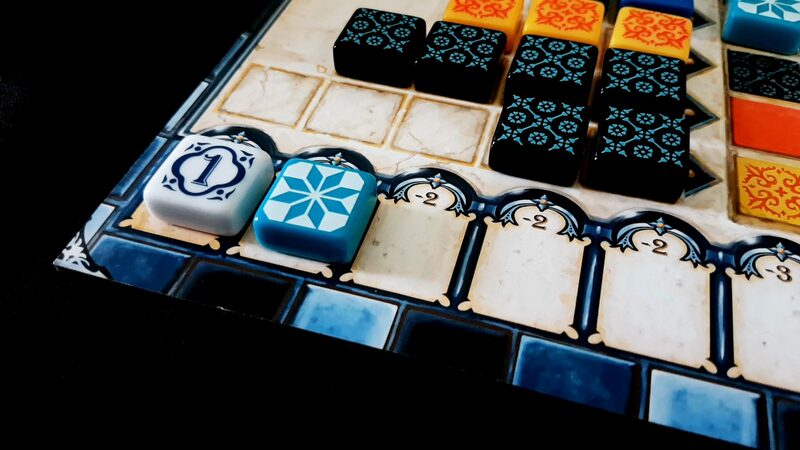 If everyone has played well the last action you take in Azul will be accompanied by a clicking of tiles that has all the grim overtones of a trap snapping shut. In Azul you’re not just picking a choice for yourself – you’re essentially compacting the decision space around the consequences of what you didn’t pick. The entire universe of the game reforms itself around every decision you make, ensuring that every option you have in the future is worth considering. There are no vestigial irrelevances in your options in Azul. Azul presents you only those choices that actually matter and then heaps a whole pile of subtle nuance onto each one. Azul keeps tightening the probability space around a filter that proceeds with serene confidence towards a final inevitability. Sagrada does the same thing, but you’re never in control of that process. You’re just its victim. Azul gives a directed intentionality to the tightening net of opportunity. It permits for the inexorable march of progress to be invested with a certain flavour of joyful malice. Azul is marked in every way by its elegance. Its efficiency. The sharpness of its design. You know what else is elegant, efficient and sharp? A sword. Azul is simple, easy to understand, and entirely intuitive. You know what else is simple, easy to understand and entirely intuitive? Yep, that’s right. Azul lets you wield your decisions like weapons, and those weapons will draw blood. A well-aimed stab will leave opponents bleeding points onto the table, looking at you with the anger and upset that is reserved for truly painful betrayal. Azul often takes your breath away, but most of the time it’s because of an unexpected punch to the solar plexus. Every decision in Azul feels weighty – it should, you’re changing someone’s world with every single one you make. The result is a game that is deeply absorbing, intensely challenging, and thoroughly rewarding to play. I have no hesitation in recommending it to your consideration.